Marlborough Preparative Meeting Complaining of Nancy Ann Hinshaw for accomplishing her marriage contrary to discipline and she produced an offering to this Meeting condemning her breach of order, which Friends not being free to receive appoints Mary McCollum, Ann Lee, and Abigail Coffin to visit her on the occasion and report to next Meeting. The Friends appointed last Meeting to visit Nancy Ann Hinshaw report not complied with. The Same Friends continued another month. The Friends appointed to visit Nancy Ann Hinshaw report they had good satisfaction with her and there was an offering produced to this Meeting which was taken for Satisfaction. Salem Preparative Meeting complains of Darius Hinshaw for deviating from plainness in dress and address - for accomplishing his marriage contrary to discipline, attending [..unclear..] and not often attending religious meetings. Aaron Stalker and George Farlow are appointed to have an opportunity with him on the occasion and report to next meeting. The friends appointed last meeting to have an opportunity with Darius Hinshaw report that they had an opportunity with him, but he not appearing at the meeting to make satisfaction the case is continued another month under the care of the same committee. Darius Hinshaw not appearing at this meeting to make the necessary satisfaction for his breach of Discipline this meeting appoints Jesse Hinshaw, Mordecai Lamb & Joseph Newlin to visit him again on the occasion & report to next meeting. The clerk reports he has complied with the direction of last Meeting. The Committee appointed at last meeting in the case of Darius Hinshaw report that as part of them had an opportunity with him but he not appearing to make the necessary satisfaction they are continued for that serve another month. Darius Hinshaw attended this meeting with an offering condemning his breach of Discipline which it resolves. The representatives being called were present except Darius Hinshaw for whose absence a probable reason was rendered. Darius Hinshaw, age 39, born in North Carolina; farmer; $460 real estate. Nancy Hinshaw, age 39, born in North Carolina. William Hinshaw, age 12, born in North Carolina; attended school. Job Hinshaw, age 11, born in North Carolina; attended school. Roswell Hinshaw, age 8, born in North Carolina; attended school. Oliver Hinshaw, age 6, born in North Carolina; attended school. Ruth Hinshaw, age 4, born in North Carolina. Susannah Hinshaw, age 2, born in North Carolina. Darius Hinshaw, age 48, born in North Carolina; $1500 real estate; $800 personal property. Nancy Hinshaw, age 48, born in North Carolina. William Hinshaw, age 21, born in North Carolina; farm laborer; attended school. Job Hinshaw, age 19, born in North Carolina; attended school. Roswell Hinshaw, age 17, born in North Carolina; attended school. Oliver Hinshaw, age 15, born in North Carolina; attended school. Ruth Hinshaw, age 13, born in North Carolina; attended school. 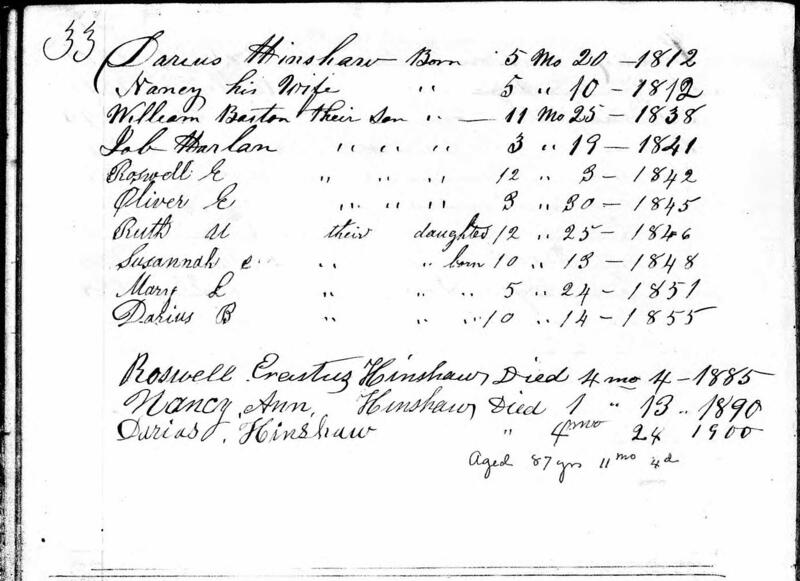 Susanna Hinshaw, age 11, born in North Carolina; attended school. Mary Hinshaw, age 8, born in North Carolina; attended school. Barzilla Hinshaw, age 5, born in North Carolina. Hinshaw, Darius, age 58, born in North Carolina; farmer; $1200 real estate; $400 personal property. Hinshaw, Nancy, age 57, born in North Carolina; keeping house. Hinshaw, William, age 30, born in North Carolina; farm laborer. Hinshaw, Roswell E., age 24, born in North Carolina; farm laborer. Hinshaw, Oliver E., age 23, born in North Carolina; farm laborer. Hinshaw, Ruth U., age 22, born in North Carolina. Hinshaw, Susan R., age 21, born in North Carolina. Hinshaw, Mary L., age 19, born in North Carolina. Hinshaw, Darius, age 14, born in North Carolina; attended school. Hinshaw, Darius, age 68, born in North Carolina; parents born in North Carolina; farmer. Hinshaw, Nancy A., wife, age 68, born in North Carolina; parents born in North Carolina; housekeeper. Hinshaw, William B., son, age 40, born in North Carolina; parents born in North Carolina; single; works on farm. Hinshaw, Darius B., son, age 23, born in North Carolina; parents born in North Carolina; works on farm. Hinshaw, Ruth U., daughter, age 30, born in North Carolina; parents born in North Carolina; single. Hinshaw, Mary L., daughter, age 25, born in North Carolina; parents born in North Carolina; single. Henley, Susana R., mother [sic], age 25, born in North Carolina; parents born in North Carolina; widow. Henley, Nancy V., daughter [sic], age 4, born in North Carolina; parents born in North Carolina. Davis, Miriam, age 60, born in North Carolina; parents born in North Carolina; single. Asheboro, N. C., July 15. -- (AP) -- Stockings made in 1812, now the property of the third generation of the family since they were made, are the cherished possession of Mrs. S. R. Henley of Randolph county. The stockings were made for Darius Hinshaw by his aunt, Mrs. Hannah Hinshaw, when he was only a few days old. His daughter is Mrs. Henley, who is one of the older citizens of the county. Mrs. Hinshaw raised the cotton, spun the thread and knitted the hose. The stockings were worn, Mrs. Henley says, by her father, his children and his grand children. Another prized possession of Mrs. Henley is a red silk bandanna handkerchief which belonged to her brother, W. B. Hinshaw, 80 years ago. Posting Jul 27 2000 by Lora () to INSHELBY-L.
1870 census, Ashboro P.O., Back Creek Township, Randolph County, North Carolina; roll M593-1156, page 308, line #8, dwelling #207, family #216. 1880 census, Back Creek Township, Randolph County, North Carolina; roll T9-0978, ED 215, page 93B, line #11, dwelling #293, family #293. 1880 census, Back Creek Township, Randolph County, North Carolina; roll T9-0978, ED 215, page 93B, line #34, dwelling #297, family #297. 1880 census, Back Creek Township, Randolph County, North Carolina; roll T9-0978, ED 215, page 93B, line #37, dwelling #298, family #298. "The Bee" (Danville, Virginia), Jul 16 1931; http://www.ancestry.com.